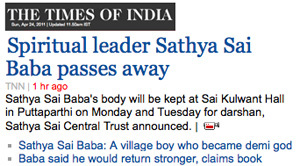 « Sathya Sai Baba to be ‘resurrected’ on Easter Day? This entry was posted on April 24, 2011 at 6:55 am	and is filed under Cults, Gurus, India, Propaganda. Tagged: Robert Priddy, Sathya Sai Baba, Sathya Sai baba death - no miracles USA, Sathya Sai Baba USA, Sathya Sai Baba USA news. You can follow any responses to this entry through the RSS 2.0 feed. You can skip to the end and leave a response. Pinging is currently not allowed. 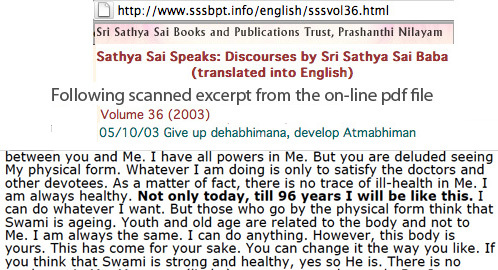 This is the level of many Sai devotees… imagine something, then believe it! Anyone can easily find out that I am a non-theist, that I have never been a Catholic or had any connection with that church. This person gave no name (but ‘ayran108’ shows he is under the spell of Sai Baba’s stupid borrowed number mysticism) and he submitted an invalid e-mail address… typical cowardly behaviour by so many Sai devotees who try to harass critics. He lives in London for he could not hide his IP, which is 86.21.146.124… a shame UK has allowed so many illiterate Indians to settle there, hope he gets an education some day though. The motivation is obvious.. not love from the heart, which Sai Baba so unrealistically demands even his rabble-rousers should show from when they Satart the Day until the End the Day! He also tries to denigrate believers in Jesus… not what Sai Baba teaches either.90% of comments against me are sent anonymously… what are these people so scared of? Have you been sexually abused by a catholic priest in ur lifetime? Coz it sure sounds like that from ur retarded ranting on here. Get a life u jesus freak.